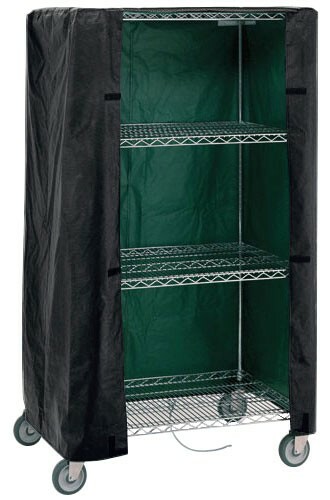 ESD Cart Cover Conductive Wire Shelving - CC215463CO - 21" x 54" x 63"
21" x 54" x 63" ESD Nylon cart covers have reinforced vinyl with electrostatic protection. 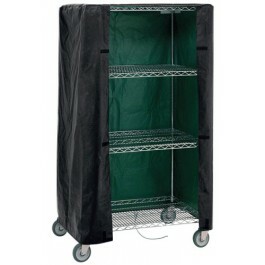 These ESD cart covers are resistant to organisms that degrade, stain or impart orders. Inherent flame resistance to minimize fire hazards. Excellent tear strengths, punctures will not product running rips. Construction designed for ticking fabrics. Non-penetrable surface, liquid waster and hospital medicaments cannot penetrate. Color is permanent, non-fading and non-bleeding. Wipe down with mild soap, rinse with water. Color: Black/Green. **Note: Cart covers are custom made to order and can take up to 10-14 business days to ship. 21" x 54" x 63"